The software translation project had over 5,000 words. I translated a 1,600-word document on ecology and environmental protection for a US NGO, from English into Spanish. Environment & Ecology No comment. I completed a 120-hour linguistic QA project for the Spanish version of electronic component design software. In the past five years, I have translated several small files (around 200 words) for this client. In the past four years, I have translated many birth and marriage certificates as well as grade transcripts for this client. I translated around 20 files on mechanical engineering for this client. Food & Drink No comment. I have completed several large SAP software projects for this client. I have translated around 6 phone marketing surveys for this client. The total number of words is over 20,000. Blue Board outsourcer (50 to 100 entries): Patricia provides well written accurate translations which are always delivered before the job deadline. I translated several files on backup software and related products. I have completed several legal translation projects for this client, from Spanish into English. 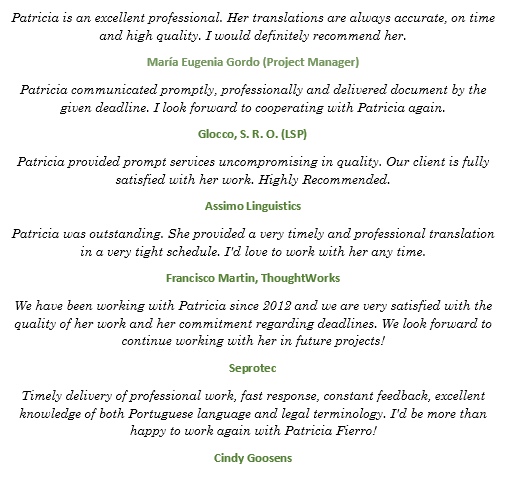 Blue Board outsourcer (20 to 50 entries): Patricia is an excellent and experienced translator of legal documents! Blue Board outsourcer (10 to 20 entries): Professional, reliable, consistent and right on time! A partir de la aceptación electrónica de este Contrato y de llenar el registro, el usuario adquiere el derecho de usufructuar de todos los servicios ofrecidos por el sitio web, de manera completamente gratuita. O Só Português poderá enviar e-mails para o endereço eletrônico do usuário, caso ele solicite por meio do link "Receba o informativo", no rodapé da página. The Slack client connects to the Slack RTM API. Once it's connected, it calls a Web API method (auth.test) to find Starter Bot's user ID. Next, the program enters an infinite loop, where each time the loop runs the client receives any events that arrived from Slack's RTM API. Notice that before the loop ends, the program pauses for one second so that it doesn't loop too fast and waste your CPU time. Experience Years of translation experience: 22. Registered at ProZ.com: Feb 2000. Became a member: Jan 2004. Professional practices Patricia Fierro, M. Sc. endorses ProZ.com's Professional Guidelines. 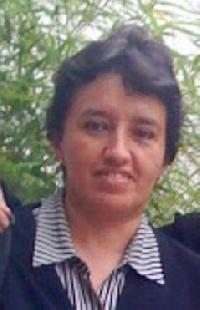 I am a native English and Spanish Translator with over 20 years of experience. I lived in the US for 14 years. Software, telecomm, legal documents, SAP, finance, math, physics, pharmaceutical products, mining, architecture, and all engineering fields.